My GPS track is in geographic coordinates (latitude and longitude) and I need to project the points to be able to show the track on my map of Jotunheimen. 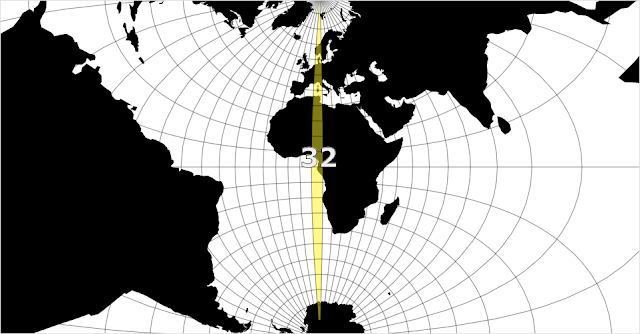 Three.js don't have any support for different map projections, but we can use the great projection support of D3.js. My map is in the UTM 32 projection, and I've played with UTM in D3.js previously. translate: The pixel coordinates of the projection’s center. rotate: I'm rotating the projection minus 9 degrees longitude which corresponds to the central meridian of the UTM 32 zone. center: The longitude and latitude of the projection’s center. This is the same as the center of my map (8.286, 61.512), except that the longitude position is relative to the central meridian of UTM 32 (8.286 - 9 = -0.714). In Three.js the coordinate system works as follows. Point (0,0,0) is the center of the world. As you look at your screen, positive x values move to the right and negative x values move to the left. Positive y values move up and negative y values move down. Positive z values move toward you and negative z values move away from you. 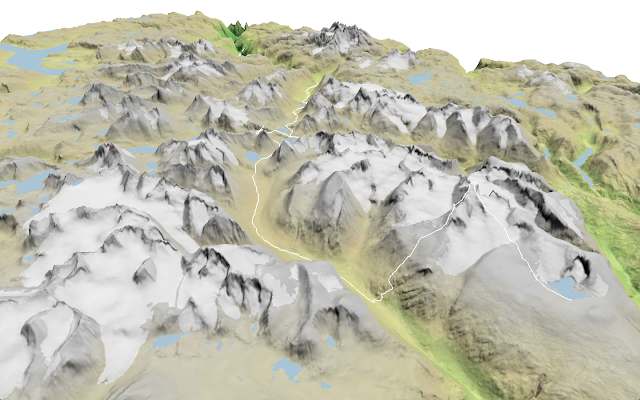 The elevation values are also multiplied by a height factor which is the same I've used for the terrain. In addition I'm adding a small offset, so the track is rendered slightly above the ground. The code is available on Github. An alternative would be skip the elevation values in the GPS track and instead clamp the track to the terrain, but I haven't found an easy way to do this with three.js. This is really cool Bjørn. It would be nice to add some (open source) license in the github repo with your repository. At the moment I'm not sure if I can use parts of your code on my site. Great. This is what I wanted to make. While still struggling heartily with getting my shapefile to line up properly in conjunction with D3 (projection problems), I took a very cheap shortcut that had decent results; My gpx was converted to a shapefile and layered upon my terrain imagery via LineSymbolizer in mapnik (at the same time I was adding lakes and rivers). 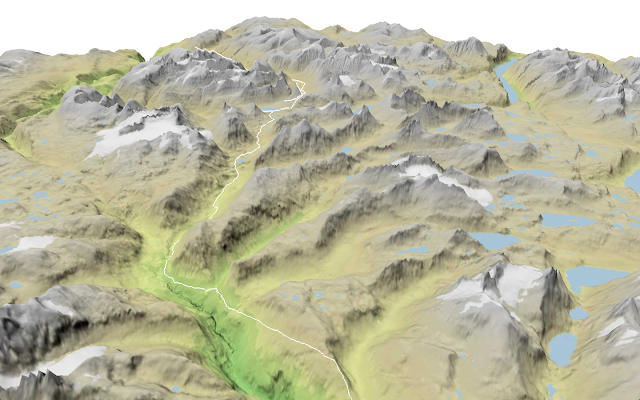 After testing on one of my own hikes' tracks, I can attest that it draped quite well over the three.js terrain area right where I was traversing along the ridges. Nowhere near as cool as what you showcased, but I thought I'd throw it out there! how i can calculate distance between tow point?? ?is there any way for it? Awesome expriment, love playing with the code. If your code is open source, would you mind adding the open source license on the git hub repo ? Wouldn't dream of reusing it without the license, got too much respect for fellow coders. First thanks for the clarity of your post.